Welcome to #Fahrenbruary Day 4. In the piece below, Ian describes how his experiences as a (ex)serving police officer influenced his writing, and of the challenge of writing for a character as corrupt as Sam Batford and his boss Mike Hall. Tomorrow I’ll be presenting a Q&A with Ian. 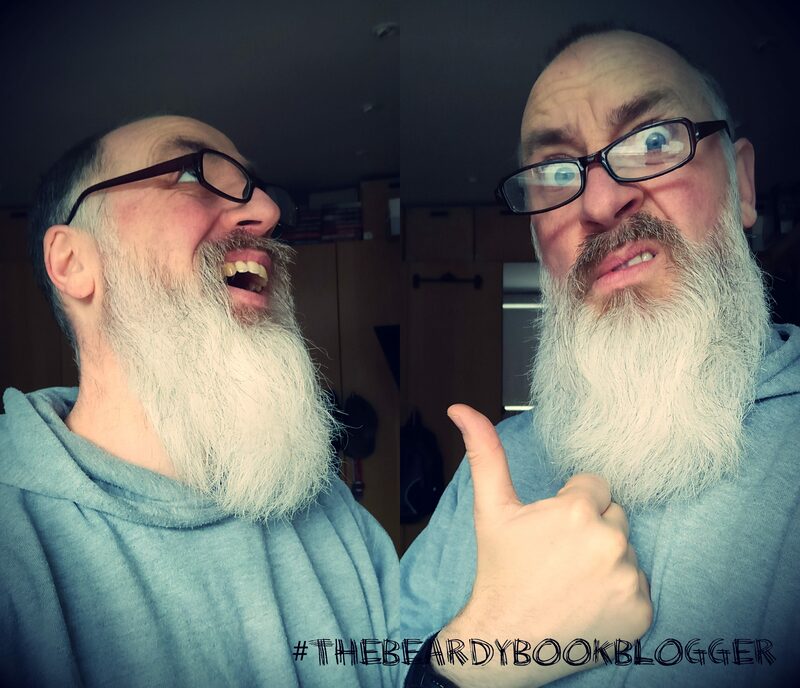 Ian Patrick: The Beardy Book Blogger? Huh, what’s so special about having a beard? “I’ve been asked as part of Fahrenbruary to prepare a write up on how my police experience influences my writing. I introduce the topic early doors so you can leave now should you wish. Truth is I never set out to write crime it just happened that way. I’d heard the saying you should write what you know but to me what I knew would be incredibly dull stuff eighty percent of the time and the other twenty I’d never factually write about, as I couldn’t, due to the nature of the work. That wasn’t enough to stop me writing. For me to enjoy the writing it had to be challenging as well as provide what I hoped would be entertaining reading. As a reader I know what books I enjoy and the writers that have influenced my reading choices. Each one brings something fresh to the table. The challenge was making the police work believable while maintaining a fictional arc. As an officer I acted with honesty and integrity and expected my team members to be the same. I was fortunate to work with some great people for my entire service. No matter what department I ended up in I was blessed with great staff. As a manager the values of honesty and integrity were paramount and any suspicion of corrupt practice would be dealt with. I never had to arrest a colleague. I use the term colleague lightly as they’d have been a criminal, with a badge. So the challenge for me was writing about a corrupt officer who went against my core values and beliefs and yet had a certain something about him that would entice the reader to like him despite his flaws. Enter DS Sam Batford of the Met Police Under Cover Unit. A manager’s worse nightmare and a ticking bomb for the police service. Despite all this he gets the job done but doesn’t deliver the full results expected of an officer in one of the most demanding roles in the police. An officer with access to: freedom, guns, money, cars, drugs, and criminals. What could possibly go wrong? In reality, plenty! It would be naïve of me to think that at this present time there isn’t an officer, like Batford, somewhere in the country. I genuinely hope not but sooner or later an officer will come to notice for crimes you wouldn’t believe could go undetected. This was another fear of mine that due to the current cuts the services have been experiencing over the past seven years the criminal minded would reap the rewards of less policing resources and fill their shoplifted boots with all they can get. This includes those who are within the service. So much work has been done since the heady days of the seventies and eighties to combat corruption but this area takes significant resourcing if you are to address serious and organised crime from within. When resources are reduced, priorities shift and this leaves a wide open door for the criminal minded to exploit when resources are pulled from one area of policing to another. So far I’ve written three books in the Batford series, Rubicon and Stoned Love are out now with Fools Gold coming out this summer. Each one really takes it out of me to write, as I have to think like a corrupt officer. I’ve been trained to look for signs of corruption, been in roles where my vetting level was high in order for the service to be as happy as they can that I wasn’t showing any triggers in my life that could lead to corruption. The more sensitive the role the higher the vetting level required before you can undertake it. So getting in the mind of a corrupt officer and exploring the motivation to be that way is both challenging and at the same time perversely entertaining to see what Batford could get away with. My sincere thanks to Ian for taking the time out to write this piece for me and for #Fahrenbruary.